All of a sudden the heart sprang to life. It sparkles; it glitters; it’s magical. I really did enjoy stitching it and am very pleased with how it turned out. I hope you are too. 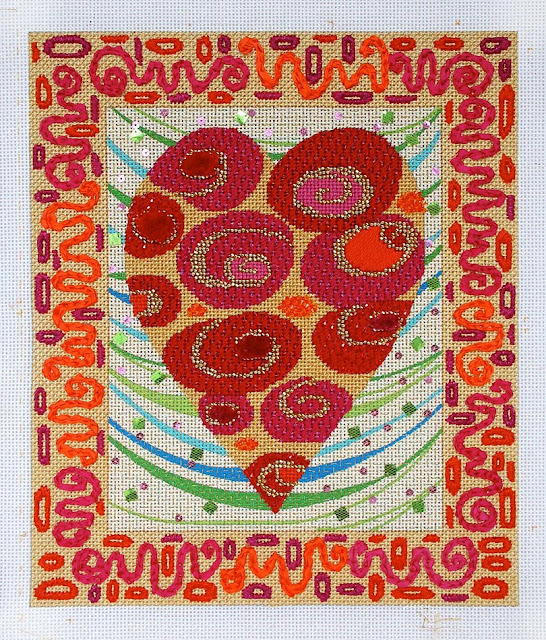 The flowers in the heart are a wonderful Diagonal stitch worked in Vineyard Silk that leaves little spaces for metallic thread or crystals. I used the new hologram kreinik ribbon as the accent in some of the red flowers, crystals in others. I love the sparkle of the hologram thread. The stitch pattern I selected for the flowers is a little bit of a challenge, I admit it. Partway through class today we decided we needed an option. The option we chose is Diagonal Parisian Tent Combination. I’ve attached the diagram here for those of you stitching this long distance. Feel free to substitute this stitch for some or all of the flowers. Your choice. If you work the Diagonal Parisian in the Vineyard you can still use metallic or crystals for the accents. The orange spots are completely crystalized with swarovski crystals. The final touch is the border. Squiggles upon squiggles of fuchsia and orange Chain Stitches. They are fun and whimsical and quick to stitch. All in all this was the most fun mystery to solve yet! « Previous Mystery Post: It’s starting to look magical! Very pretty! I bet it really sparkles in person, too. Nice job once again, Ruth!